Walt Disney has announced the buyout of UTV Software Communications Limited, which will increase its stake in UTV from 50.44 per cent at present to 100 per cent. The company plans to sign a delisting offer to acquire 29.74 per cent from the public at a price not exceeding Rs 1,000 per equity share. In the event of successful delisting, Disney will buy the remaining 19.82 per cent from promoter Ronnie Screwvala and his associate companies at the same price. After the acquisition, UTV will delist from BSE and NSE. 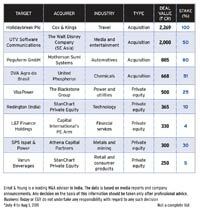 The deal, potentially valued at Rs 2,000 crore, may enable Disney to strengthen its foothold in India's media and entertainment industry, as well as help Disney synergise UTV India's operations.